I love to look out on the backyard first thing in the morning. 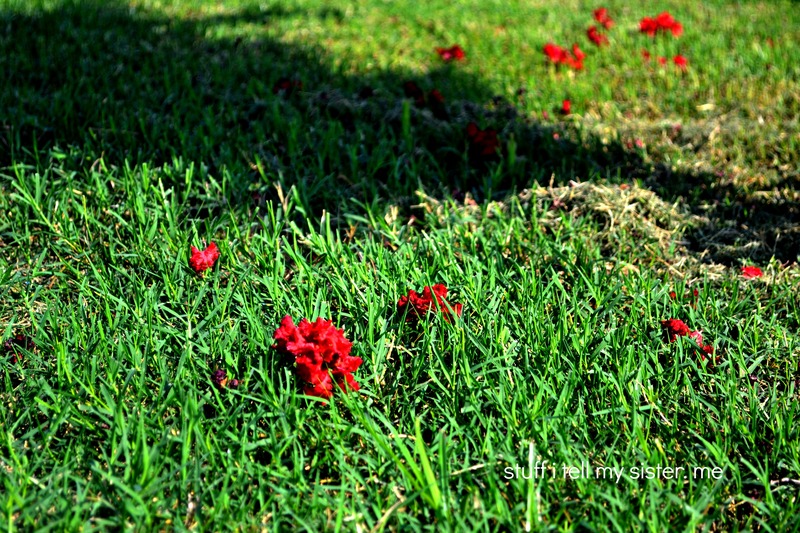 I turned the pups loose a bit ago and as they scampered about…I notice it had rained crepe myrtle blossoms. Crepes myrtles are my favorite flowering tree/bush of all times. They thrive in the heat. Their flowering stems look lovely in an old wine bottle on the front porch. But mostly, they remind me of summertime at Grandma’s house. ♥ Crepes can bring smiles and surprises. Happy Monday! Sugar is exhausted from the morning “hunt”. 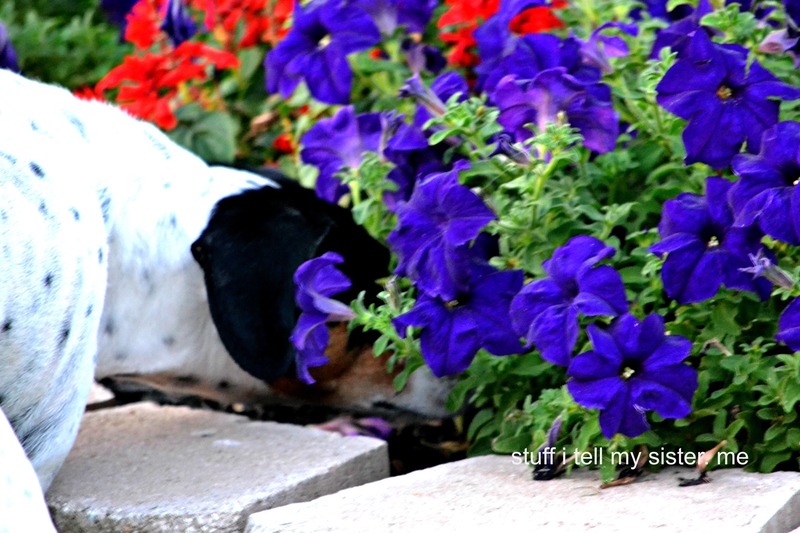 This entry was posted in Family, Flower Photos, Oklahoma, photos, Ramblings, Reflections and tagged blossoms, crepe myrtle, crepe myrtles, Flower, Flowering crepes, flowering tree, Grandma's house, Lagerstroemia, morning hunt, raining crepes, Spider, summertime. Bookmark the permalink. That’s about my speed too. Great photo of the spider but I’ll admit I croaked, “Aaaagggghhhh” when I scrolled down on him. ahhh summer [happy sigh] Love the photos! Oooh..loving the spider and her web – cool shot! Love the crepe myrtles too…they are all over where I live also – and thrive and blossom in the heat here! Had a HUGE one at the old house, and a small one at the new house…love it! 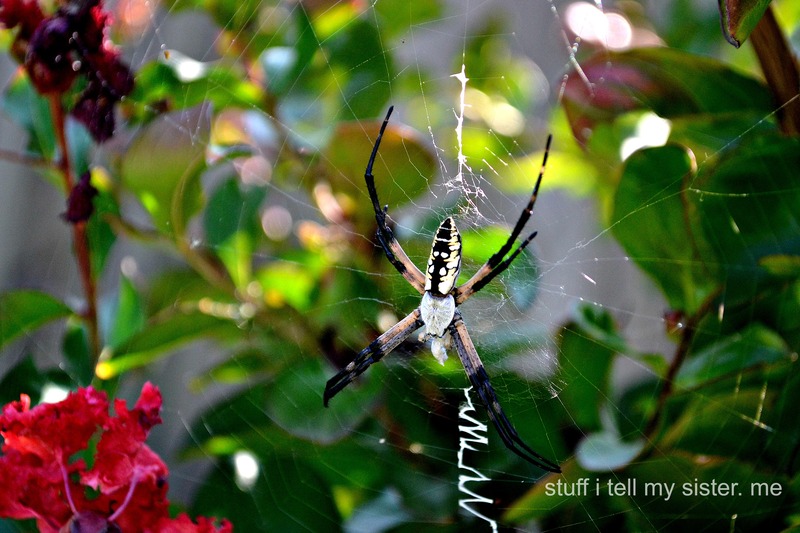 Thanks Bon Bon….creepy crawly spiders….but so cool looking! I love my crepe myrtle – it’s that last pink before the leaves turn. They do hang in there. don’t they! 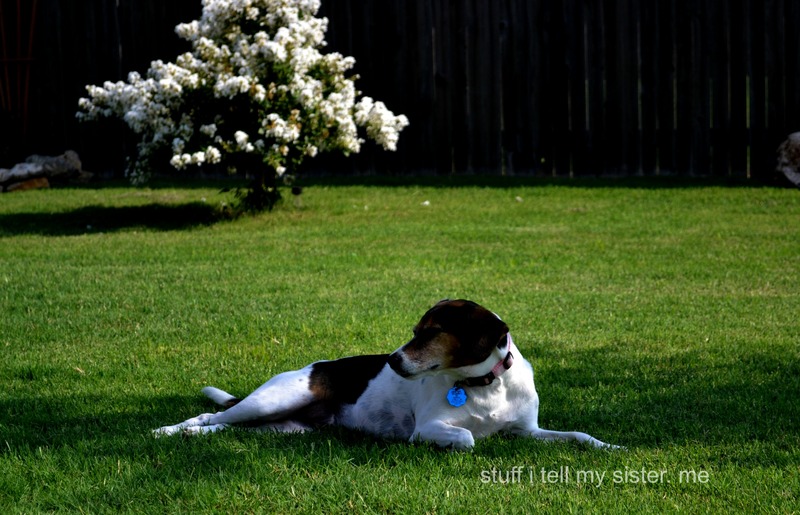 I love your dogwoods in the spring though…. Yeah – but they are long gone. I miss them. Something to look forward to though! Nice! I miss crepe myrtles, but here in Canada they just won’t grow, not like in Texas! Hmmmm….I wonder if you could grow them inside…potted? Just a thought. I’ve never heard of it being done. I might have to look into it. Your photos are ridiculously beautiful. Spider and all, they were so nice to view. I love Crepe Myrtle, too, they hold up well in the heat around here. Crepe Myrtle trees are also my favorites. Great picx! Summertime at Gramma’s house indeed! Oh the beautiful memories! 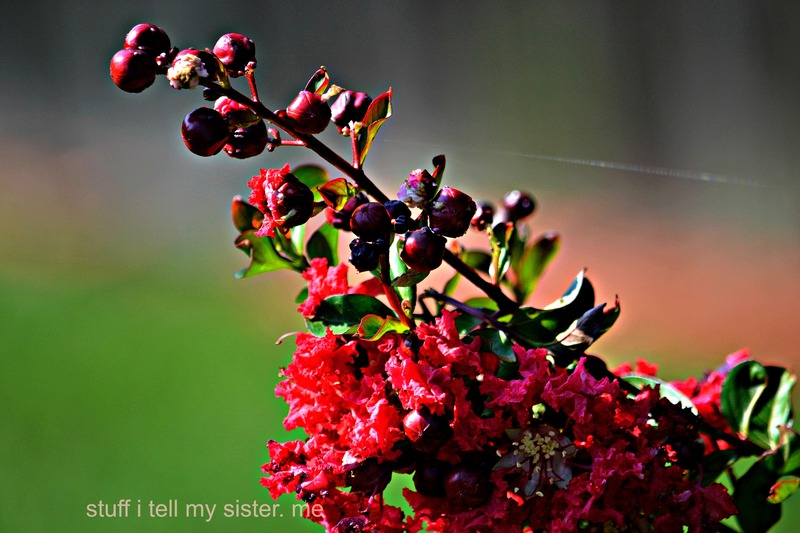 I love crepe myrtles (even though I don’t have any – yet) and also love those garden spiders – so pretty – both of them! But they need a lot of sun right? My yard is void of any sunshine, which is great for keeping my house cool, but lousy for any color. They love the heat, that’s for certain. Is it just me, or are they exceptionally pretty this year? I think the cooler temps and ALL THE RAIN have made them bloom longer.